In Canada, a local author and furniture maker addressed a receptive Perth Town Council (ON) on joining the Transition movement. The Mayor was in full support and offered to help facilitate a public meeting to further the discussions. Read more in the Ottowa Region. In the April TT-Comox Valley (BC) monthly meetup, they gathered in Courtenay to discuss how to tap into personal motivations as a source of self-fulfilment and community action. “In Belgium, in and around cities, Transition initiatives are getting set up and manage to get to the critical mass needed for survival and development. In more rural areas initiatives are taken too, but often silently die because due to the smaller size of the villages, the effort rests on too few people. federating the municipalities Bonheiden, Duffel, Sint-Katelijne-Waver and Putte, located east of Mechelen. The purpose of the transition group is to foster the development of local transition groups in the individual villages, where distances are smaller. Two main tools are currently being used for this. 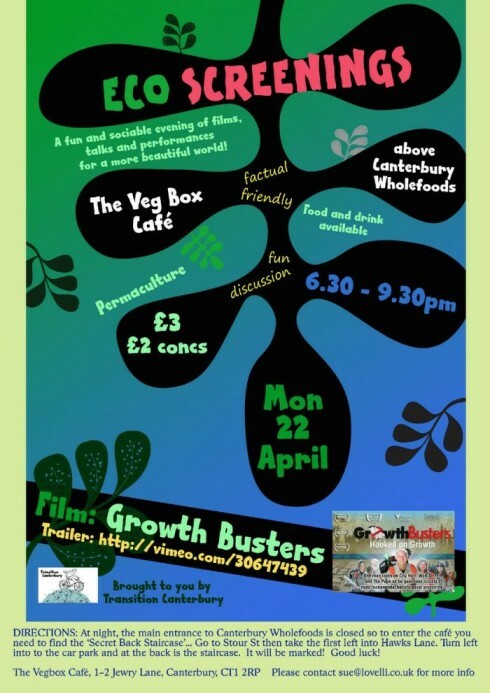 The monthly Transition Cafes bring together people from the whole area and around. They allow people to meet, and introduce them to the basic findings and ideas of the transition movement. Even more important, the transition community De Weegbree is located in the Bodukap area, and offers a living example of sustainable living, as well as a series of transition-related courses and workshops. The initiative started in 2012, and we hope to see local communities being set up in the villages throughout 2013″. 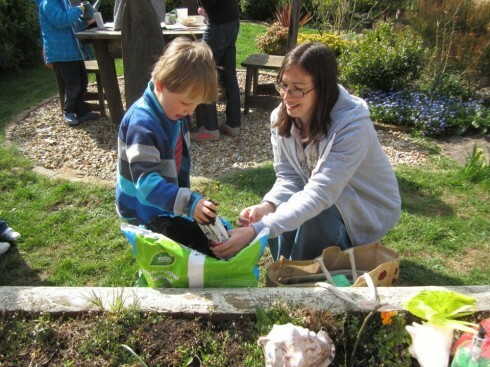 To the US now, and St Anthony’s Park (MN), a mulling Transition group registered on the TN website in late 2012 are really evolving and starting to make a presence in their neighbourhood. They held a Transition Festival to invite members of the community to look at their working groups and spark general interest. And here is an article in the Community Voices section of the local MinnPost on how the St Anthony’s Park group got started and how they share the Transition vision. TT-Manchester (VT) sponsored an event with a garden designer and author Ellen Ogden called Art of the Kitchen Garden. Core group members of TT-Payson (AZ) have been getting out and about in the community sowing seeds of support and in a great example of what community cohesion looks like in reality, the group worked seamlessly together to shift a whole ton of manure to the community garden which is being prepared for an addition 60 to 100 plots! A shared story and history that gives a community a sense of itself — its struggles and lineage — can be an important source of resilience. From its own experience, a community can draw examples and role models for bouncing back from hardships. In this tele-seminar, we will explore ways of developing our story as communities in transition, and how important fresh narratives can be for unleashing a coherent transition town initiative. It is springtime, and Transition is blooming. The best proof of this was the 2nd Annual Meeting of Transition Movement just held at Mijas-Malaga on April 12 to 14, with the title of “Transition Tools”. The conference, organized by the local initiatives of Transition, Mijas-Fuengirola,Transition Coin and INtransition Marbella, with the support of the Spanish Transition hub, resulted in three magical days. An example of Transition in its purest form. Just for the clueless, what is the Transition Movement or Transition Towns? In a nutshell, it is one of the major socio-environmental experiments nowadays. Towns, cities or eighborhoods, in face of the economic crisis, the inevitable decrease of energy consumption in our lives, and the great vulnerability of our oil dependent society, decided to organize a collective and creative process of Transition towards a more localized, resilient future, a future with better quality of life, adapted to each specific context and recognizing the physical limits of our planet. In short, a movement that invites us to turn from indignation into action. But let us continue with the story… Under a brilliant spring sun, and with a lovely hand-painted shell tied around the neck, this second meeting gathered more than 100 people from different places in Andalusia (Seville, Granada, Malaga, Marbella, Mijas, Jerez, Tarifa, etc. ), and many other regions of the Spanish State (Madrid, Bilbao, Barcelona, Albacete, Murcia, Valencia, etc.). 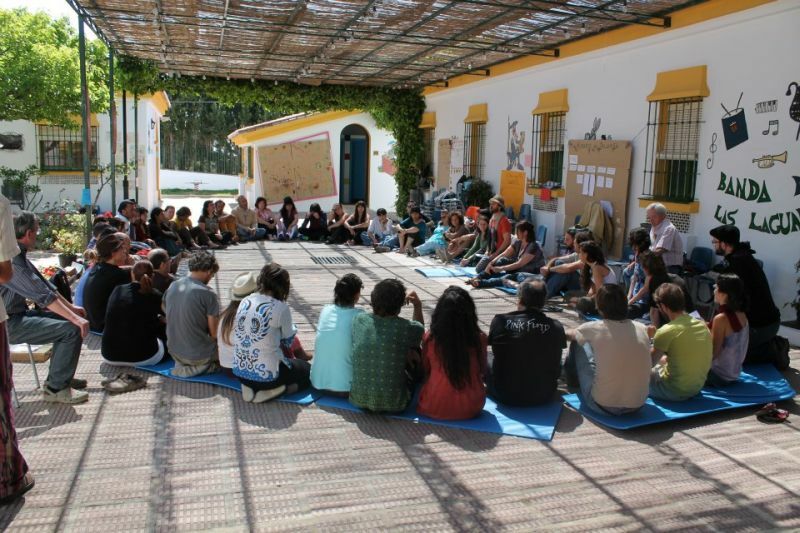 The Transition Movement, the “New transition” in the words of Carlos Fresneda, evolves showing its vitality and good health, indeed, in just 7 years there are already more than 2000 groups around the world, about 40 of them in Spain. The main objectives of the event were to give visibility and strengthen the Transition Movement, to continue with the task of creating the Spanish Transition Network, to empower the people and the initiatives through the provision of tools and, of course, to know better each other and celebrate. All this was achieved by far and in an atmosphere of great camaraderie, joy and enthusiasm. What more can we ask for? Workshops on social currencies, systemic thinking, Dragon Dreaming, inner transition, creativity, tricks for working groups, conscious food, or energy saving, among many others, together with dynamics extracted from Transition Training on Transition ingredients, deep ecology or the Backcasting methodology, as well as a large Open Space and a spectacular Fish bowl, guided the participants through an intense journey through the head, heart and hands of Transition. Besides, if that all wasn’t enough, we had a market for the exchanging of organic seeds, sale of local products and a fantastic free market fair, and, of course, the presentations of the (17!) initiatives attending, concerts, theatre, delicious meals and lots of surprises. However, above all, what made this Conference so special was the art of the people and the atmosphere of Southern Spain: the music, the dancing and the flair. The Sun, blue sky and stars. Joy in abundance, improvisation, colors and magic. Once more, a new instance that Transition is special because it is fun, because when you live it you get goosebumps, because it is unique. Back to the UK now. In Brechin (Angus), in Scotland, members of the community launched their campaign to become a Transition Town by holding a Cuban themed evening in a local hotel which involved a film screening of The Power of Community, Salsa dancing, music and Cuban style food and drink. Sounds fantastic. 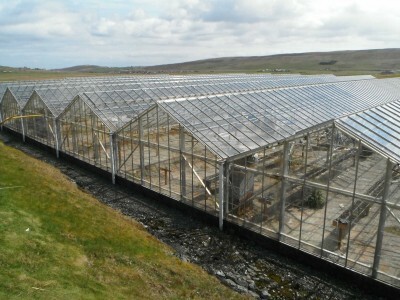 Also in Scotland, Transition Shetland is currently preparing to compile a feasibility study into turning the huge, empty glasshouse near Tingwall airport into a large scale community growing project. Read more here and check out this photo. That’s a lot of potential lettuces or grapes. Or coriander. 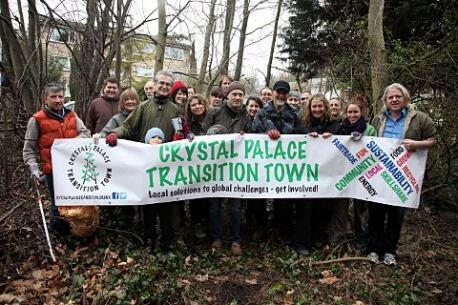 Members of London group Crystal Palace TT, whose ‘Palace Pint’ was the lead story in last month’s Round-up, got together to help clean up the area (see photo below). T-Horsham (West Sussex) are the grateful recipients of a shed which was donated by a local nursery for use at the community allotment. Read more here. 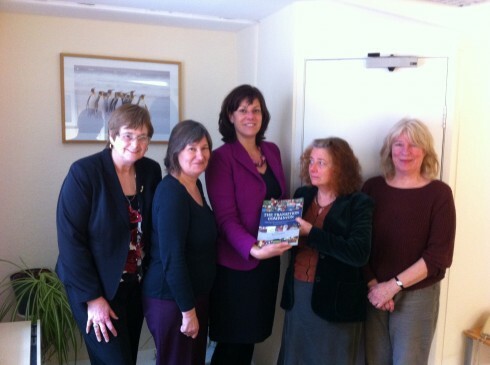 Transition Basingstoke wrote an interesting post reflecting on “just what is a Transition initiative anyway?” In Wiltshire, T-Marlborough had a meeting with local MP Claire Perry. As well as presenting her with a copy of the Transition Companion (see photo below) they also sat down to talk about the governments Green Deal and how it is not really working with social housing. T-Marlborough have plans to expose and address rural energy poverty – read more here. To Totnes now, and here is a delightful taste of how it is when a project, long dreamt-of and worked for, finally tips over into reality. The Transition Homes project has been discussed here in the past, and its plans to build 25 low energy affordable homes using local materials. Now, after several years work, and one potential site that fell through, they have actually bought a 7 acre site on the edge of Totnes. 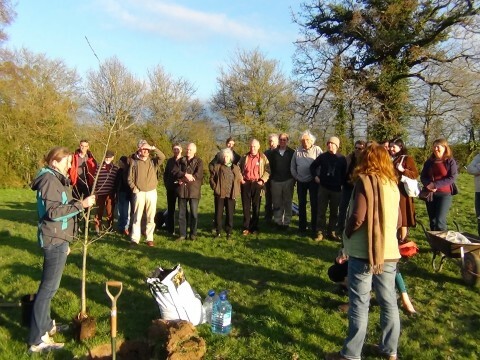 With much celebration, they are now moving forwards with site designs and celebrated the purchase of the site with the planting of an English Oak. Members of the Transition Homes project celebrate their land purchase with a ceremonial tree-planting. It’s not just Transition Homes that is nearing the ‘doing’ stage. The Atmos Totnes project is close to an agreement with the owners of the Dairy Crest site (news on that coming soon). Greg Barker MP, Minister for Climate Change, visited Totnes on 26th April 2013 to see the work of Transition Town Totnes. As part of the visit he spent time at the site and heard about the project. Here are some of his reflections on why the Atmos project matters. Also, if you are visiting Totnes this summer and would like to be part of a formal ‘Transition Tour’ of the town, have a look here for times and dates. 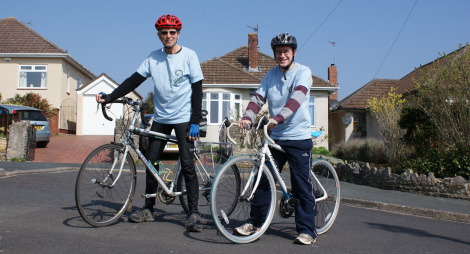 Totnes is in South Devon, but what about Transition in North Devon? Pete Yeo of the Funding Network has written a fascinating post about what he sees happening in that part of the country, and the green shoots of Transition he sees popping up there. Lastly, there’s an update on the work of the REconomy Project from Fiona Ward, and a related post from Filipa Pimental (T-Network’s National Hubs coordinator) on her home town of Portalegre in Portugual and the impact on community of industry shutting down. That’s it for this month, do send us any stories you would like to appear in next month’s roundup.